We enjoyed these unusual 16" Extra Dry hats, but the pedalled response lets them down. Excellent tones when closed. 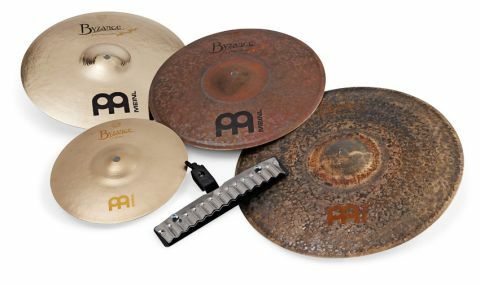 Dark tones with a great wash.
Meinl is the German company synonymous with cutting- edge techno cymbals, but from 2000 Meinl has also had its own facility in Turkey knocking out more traditionally manufactured cymbals, sending them back over to Germany to be marketed. These are the Byzances, hand-hammered in classic cast B20 bell bronze. "Although most hi-hats are 14" there is no law that says they have to be"
￼￼￼￼￼￼￼Although most hi-hats are 14" there is no law that says they have to be. Small hi-hats have long been popular and larger diameter pairs are not new. So this Byzance Extra Dry Medium Thin 16" pair makes an interesting alternative. They are part of the Extra Dry Series, medium thin in weight, heavily hand-hammered with one side un-lathed, mottled dark-brown, while the inner surfaces are lathed and shiny. "They're darker so they get out of the way of the vocalist and they feel good when you're driving a band. They sound like what I hear on records through compression. And you can play a great shuffle." Old skool groovers like Steve Jordan and Charlie Drayton also play mega-hats, so they are obviously favoured by the bluesy-r'n'b-soulful crowd. We must say we enjoyed the sound of these when closed. With them being medium thin they really are dark and earthy, dry with an attractive, warm quality. But still with just about enough stick definition and a mighty half-open wash. The problem comes when you try to pedal them - they are achingly slow and ponderous and the 'chip' sound is much muted. In fact if you don't set the bottom tilter angle just right you don't hear any chip at all. And as for the 'shoop', it's more like soup - turgid, slow and washy. We think a heavier bottom cymbal is needed to overcome this.